Because I believe anorexia and bulimia to be syndromes that encompass far more than disordered eating, I am uneasy with the common usage of the terms anorexic and bulimic as body-centered nouns. Human beings are far too complicated to be summed up by any single word, particularly one that focuses on physical appearance or illness. Recovery is all about moving beyond such limitations. This book, then, seeks to share and challenge commonly held beliefs about eating disorders. She goes through the research to examine what we know and don’t know about eating disorders, and puts it into an understandable context. 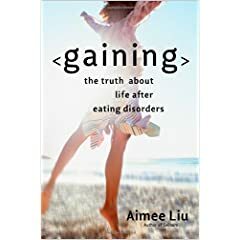 Liu also conducts interviews with more than forty others who have also grappled with eating disorders to help put not only a human face on these issues, but help people understand how eating disorders like anorexia and bulimia have little to do with culture, class, gender or even weight. What does then? Liu found genetics, temperament (or personality), anxiety, depression and shame all are very important components of most people’s eating disorders. Liu’s writing style is down-to-earth and very accessible. The book was a joy to read at 270+ pages and includes a selected bibliography. I especially enjoyed how she compared experiences of 20 years ago, when she first grappled with eating issues, to now (and what the research showed then versus what it shows today). She adds just enough statistics and facts intermixed with personal experiences of her own and that of others through the interviews to make a perfectly balanced and poignant book on this difficult subject. She goes from Freud to genetics, from a family history of mental health issues to her own experiences in therapy. It feels like a well-tread journey because that’s exactly what it is. At the end of the book, you feel as though you’ve traveled with an expert guide. Liu has really done her leg work and it shows. For anyone who’s ever grappled with an eating disorder or knows someone who does, this book is an eye-opening, must-read.